Well, if you successfully installed leJOS using the tutorial then your first steps would be to write a program to do something with it and then you will see the abyss that exists between you and a nice leJOS program. So let’s learn leJOS basics to write our own programs. Most of the documentation available for leJOS is oriented to Mindstorms NXT and unfortunately the EV3 uses a new API that is going to be the standard in 1.0.0. What that means for you? Well, that unfortunately there are very little options to learn on your own and the samples provided for leJOS EV3 are so complex and with so many hard to follow concepts that you will have a hard time learning from them… so… here I am to the rescue! Let’s get back to our Hello World example. So to create your first leJOS program you need to create a new leJOS project and then create a new Class and make sure it has a main method. 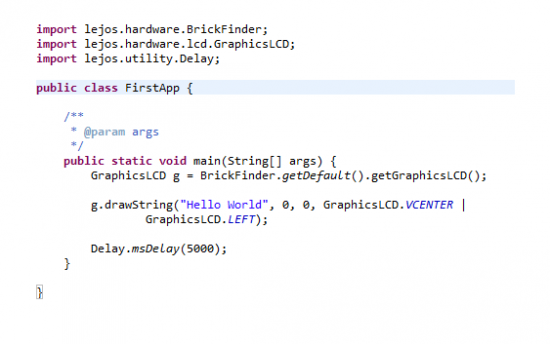 Our code is so simple we can directly write the code on the main method, no need for other methods or classes. So first thing we do is use a helper class called BrickFinder that try to determine if we are running on a EV3 and if not it tries to contact a remote EV3. On case of success it will return an EV3Brick object or an exception if it fails to find an EV3 brick. 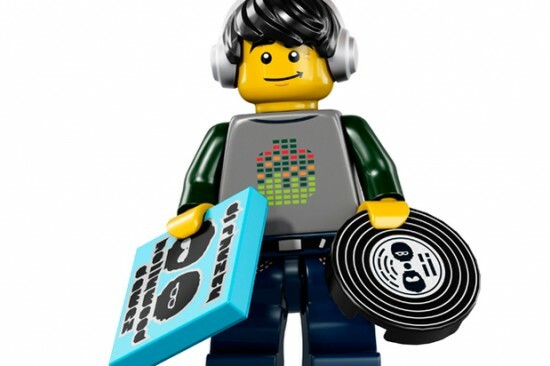 So once we have the brick we can access some of it features: buttons, sensor ports or LCD. You could just directly print using System.out.println at this point but it isn’t as exciting… isn’t it? So once we have the brick, let’s get access to its LCD object and let’s draw a string on the screen. Got it? Well, let’s do something more interesting. I am going to show you two ways of doing things… one manipulating motors and sensors directly and another way using classes available at leJOS to make your life easier. Personally I think it is a bad ( BAD! ) idea to use the latter directly without really understanding what it is going on. The good thing is that source code is available and you can study them. 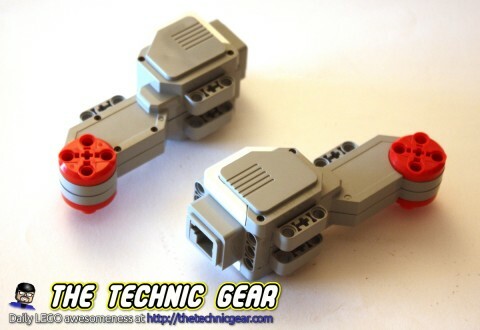 The EV3 Set comes with two kind of motors two large motors and one medium motor with more speed but less torque. There are two different class to handle them. The Medium motor is smaller and easier to attach to your robot and although it has less torque it is faster. Also you need to understand that EV3 motors are Regulated. It is not easy to notice this on the EV3 software because all the blocks give no indication about it… but on the advanced blocks there is a unregulated motor block. So what the hell means regulated? You may be aware that your motors have a built-in rotation sensors that can track changes of their position with a precision of up to 1 degree. Well, using these rotation sensors and a PID controller ( pretty much like the line following one ) LEGO coded the blocks to that when you say to a motor to move at 60% of power the motor will move to that power level but if for any reasons it is slowed down ( an obstacle, different kind of floor, more weight ) the block will increase the power given to the robot to make it move to the desired power using a PID controller. The very same thing happens when you ask it to rotate 75 degrees. 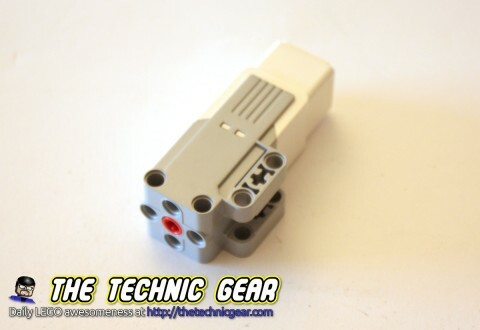 So the EV3LargeRegulatedMotor is pretty much the same that the EV3 Large Motor Block. You can check the methods on the EV3 leJOS API but I will show you the most useful. First is the constructor, we need to pass the port to which the motor is attached. So using the method brick.getPort(“A”) we get access to the A port. This is the new way of accessing ports. This class has two methods to make the motor move forward ( or backward ). The speed and acceleration is determine with other methods. So once you call any of these methods the motor will start moving. So eventually I am sure you will want to stop the motor and we have two options. The flt method will stop the current to the motor and will left it floating. The stop method on the other hand will actually brake and stop the motor. Both methods have an optional boolean parameter immediateReturn. If it is true the method will issue the order and return to its caller ( that it is usually the behaviour you want, specially when you are operation two motors in parallel ), if you skip the parameter or set it to false the method won’t return until the motor is actually stopped and that can take a few hundred of milliseconds. As with the previous methods, this one accepts an extra boolean parameter to return as soon as the order is issued or wait for the task to complete. These methods set the speed in degrees per second and the acceleration. They are really cool because let you implement the ramp up and ramp down operation of motors so you can reduce slippage to the minimum. Please don’t skip this step. Even if you think it is stupid and too simple, give it a try. You will be as surprised as I was when I realized how hard ( impossible? ) to get this right. The first step is to build a little robot to accomplish the task, so my advice is to build a differential drive robot much like this. 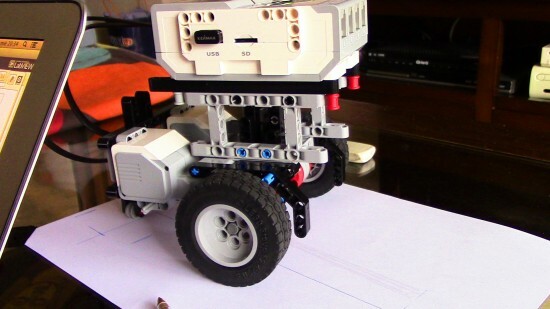 If you have problems building it, use Simplebot instructions. We are not going to use any sensor in this step. So, now that we have a robot we are going to make it move over a 50cm square so that it ends on the same position that it started. 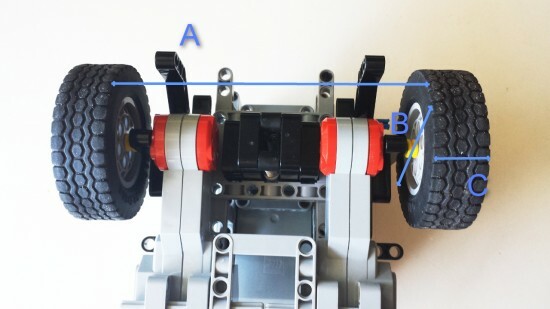 Now get a measuring tape and measure the diameter of your wheels (B), the width of the wheel (C) and the distance between the wheels (A)… much like in this image. We will use this data to calibrate our robot. I am going to use two different ways of doing this in leJOS, one is low level, much like EV3 and the other is the simpler way leJOS offers. 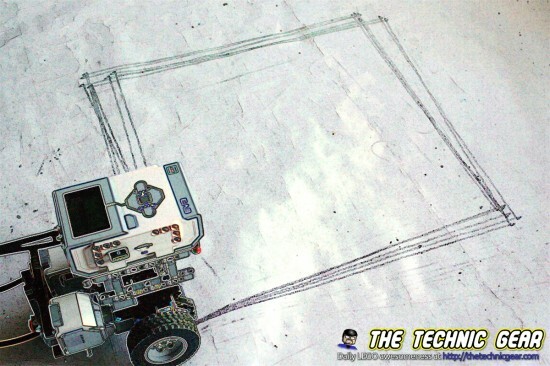 But before this, let’s see the two types of movements that we need to do in this robot: moving forward and steering. You can safely ignore the final degrees because EV3 rotation sensors has a precision of +/-1 degree. Ok, we just now need to rotate our robot 90 degrees on each turn to make a square. This is slightly more complex that moving forward but don’t get scared, it is still very simple maths. As our robot can rotate over a point ( just make each wheel rotate on different directions at the same speed and you will see it ), it will create a cicle of radius around half the track of the robot, the distance between center of the wheels. With the above information you can try it already yourself. But if you prefer you many have a look at the finished programs. * This program runs on a differential robot that has 62.4mm diameter wheels and a robot track of 122mm. * This robot has a pen on the center of rotation and it will draw a square of 40cm. // Distances and sizes are expressed in centrimetres. // K is a calibration parametrer to turn the robot. * This program runs on a differential robot that has 62.4mm diameter wheels and a robot track of 115.5mm. * It is done using the DifferentialPilot class. Ok, are you done? Now comes the fun part. Run your robot. Surprise! Did it work? I would be quite surprise if it did. So we need to calibrate it so that it work correctly. You will surely have a small error on the forward movement but a big error on the rotation movement. Yes? Why? The forward movement error can be caused by things like wheels slippage, different terrain , different level and the rotation sensor error but overall it should be quite small, maybe around 1%. Once you get it almost right you should have something like this. Ok, you are almost done. Keep calibrating the K param until you get almost a perfect square most of the times. It is the best you can do without any sensor. Don’t want to write your own code? Download from here the EV3 source code and the leJOS code for both the lowlevel motor manipulation and the DifferentialPilot class. And this is the low-level leJOS code manipulating the motors directly and the same program done using a differential drive. If you complete the robot and write or run the programs and calibrate to the best you can… you will realize that there is still an error. So without using any sensor, how can we improve even more the result? Think about it and drop a comment. I will score ideas from 0 to 10. Hope you have enjoyed this introduction to leJOS. In the next article we will introduce sensor handling using leJOS. If you have any question, drop me a comment and I will try to help you. Please, if you enjoyed this article share it with your friends. This may introduce an error because there is no certainty that the left motor will have finished when the right one does (particularly when using different numbers of degrees). If you follow this move immediately by another then leJOS will not complete the partial move instead it will blend the two moves together using the current acceleration setting), which is probably not what you want. It is always best to add a waitComplete call to ensure both motors have stopped. Secondly if you are going to use a variable number of degrees as the target for the two motors (which you may need to do if one wheel has a larger diameter than the other), then you will probably also want to use a different target speed as well (so that both motors stop at the same time). However if you do this remember to also use a different acceleration factor for the two motors, otherwise one motor will reach the target speed before the other. Thanks. I will edit the code to use waitComplete… I supposed that left would have ended more or less at the very same time than right ( or the robot won’t be moving at a straight line, isn’t it? ) but it doesn’t hurt to add it. Reading the paper right now. Thank you! Thank you! This is just the sort of easy learning steps that I need. I have tried both of the previous LeJOS books with very little success. Maybe this time I will actually learn some JAVA programming. I look forward to further LeJOS/EV3 tutorials. 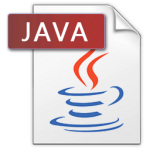 Something I am struggling with is how to get finished JAVA programs/projects into Eclipse. Hahaha. I am having the same problem between my laptop and my desktop. I will have a look at this and write a little side note about it. This helped me to quicker understand the motor control and gave further ideas … You made my day!